Sugar is a pure 100% carbohydrate. On a low-carb diet, sugar is the first ingredient you must boot out – never to return. Good riddance! Sugar is highly refined, addictive and can harm your health and well-being in many ways. But sugar is sneaky and devious. It obscures itself under innocent-sounding names. It creeps into other products where you would least expect it. And it comes in so many forms. Don’t let sugar trick you! Read our guide to most common traps sugar sets for those who try to cut it out. Sugar likes to hide under different names. Food manufacturers often use different chemical substances names instead of just saying “sugar”. Most of us know about fructose and glucose, but there are many other ones that are just as bad. Syrup is also sugar. And it doesn’t get miraculously better if there is a plant name in front! Read the labels carefully and be vigilant! Natural, unprocessed sweet foods such as honey, are getting more and more popular. Many believe that these products are better than refined white sugar – which is probably right. However, their carb content can be as high as sugar. So although these are slightly healthier options, they are still quite high in carbs. This makes them unsuitable for a low-carb diet. Many artificial sweeteners are much sweeter than sugar – up to several thousand times. Using such small doses is not practical. How would you measure out 1/1000 of a teaspoon in your kitchen? So manufacturers add fillers to bulk up their products and dilute the taste. Sweeteners with fillers have a consistency that’s similar to sugar – more practical and familiar. That makes perfect sense. But not all fillers are created equal. Some of them are full of carbs in their own right. The worst filler is maltodextrin. Maltodextrin is actually a sugar, and converts to glucose once digested. For example, some products under Splenda are bulked with maltodextrin, and contain 400 calories (all from carbs) per 100g. When buying sweeteners, always check labels for fillers. Sugar alcohols (polyols) are generally a much better choice than anything listed above. Polyols are derived from real sugar, but our bodies cannot process them in full. Therefore, some of the carbs they contain are not digestible. Their names usually end in ”…ol”. Although polyols are partially nondigestible, not all of them are zero-carb! Each type has a different carb count: some are very low in net carbs, and some are quite high. They also have a different glycemic index. To make it even more complicated, the level of polyol absorption varies by individual. Generally, the one with the highest potential carb content is xylitol. The polyol with the lowest potential carb content is erythritol (virtually zero carb). The safest way is to choose several products that you know are definitely zero-carb. And then stick with those choices and avoid suspicious or unfamiliar sweeteners. The following sugar substitutes are zero-carb and popular amongst the low-carb community. Stevia is by far the most popular and widely available plant-based sweetener. The leaves of Stevia plant are naturally sweet but contain no carbs. Dried powdered Stevia leaves can be used on their own. This would be the best option (being both low-carb and unprocessed) but it tends to be expensive. Processed Stevia extract is more common. You can get it in liquid form as drops, mixed with water or alcohol. As mentioned above, erythritol is the best option amongst polyols. Another popular product is Stevia extract mixed with erythritol, to create a granulated sweetener. This is the best option for Keto baking. It’s available under brand names of Truvia, Swerve, Natvia and Sukrin. Both Stevia and Stevia/erythritol mix have zero digestible carbs and zero calories. It is clinically proven to have no effect on blood sugar. Recommended by Dr Atkins as the sweetener of choice for the Atkins Diet, sucralose has a very long track record. It is zero-carb and is generally considered to have fewer side effects compared to cheaper artificial sweeteners like aspartame or acesulfame. 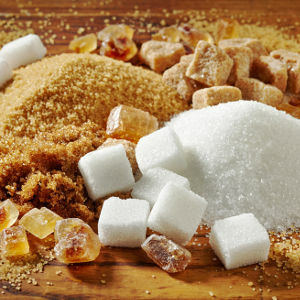 Watch out, be vigilant and banish sugar from your life forever!